who is apparently giving up filmmaking for painting. You got that right. Parenthetically, remember when Daniel Day-Lewis gave up acting to learn to make shoes? That's cool, I guess--I mean, seriously, I do wish I knew how to make shoes in the manner of the Italians--but what about us, guys? What about the movie-going public? Shoes and paintings don't put a movie on the screen, my friends. happy? or laughing diabolically at our distress? And here's a long and wide-ranging interview with the director, on Vulture. --and I certainly did enjoy each of the Oceans movies, and admired The Informant!, Solaris, and Contagion. 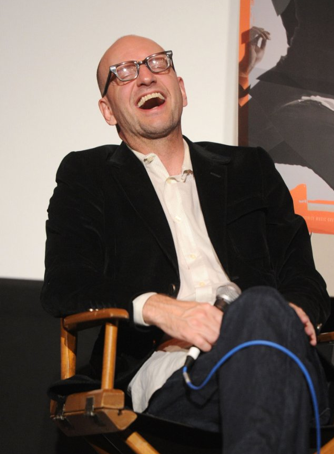 I hope you have a really good time painting, Steven Soderbergh. And I hope you find a great television show to direct. And I also hope--I really really hope--that you start making films again. I think that should happen in maybe five years. Five to seven years. I don't see how someone like Soderbergh stops making films. Joel Schumacher, sure. But Soderbergh? No. I'll go with three years.